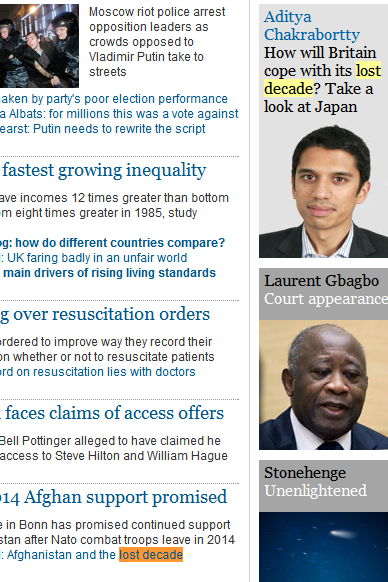 The term "lost decade" appears twice on Guardian.co.uk this morning. Once in relation to Afghanistan, and again in relation to the UK economic outlook. Using the same term to describe an impoverished war-torn country and the outlook in one of the richest countries in the world is bizarre at best. But it's not just the distinction between Afghanistan and the UK that jarred. When it comes to quality of life we've become obsessed with economic measures. And, worse, we've come to expect economic growth as a norm; periods of zero growth, however sustainable they may be, are seen as disastrous. Recession? Horrific! But we might have to face up to the prospect that GDP - the size of the overall economy - as a measure of our quality of life and general well-being is reaching the limits of its usefulness. The economic system needs to adapt to a new reality. Capitalism we know, with the exception of a handful of high profile failures, is great at driving efficiency. Inefficient manufacturers fail, usurped by more efficient rivals. But there is a finite limit to efficiency - a base cost reflecting the fair price for any good or service. Once we've reached this, growth must come from innovation and new products and services. But the full social benefit of new products and services brought by innovation in the digital revolution is not fully reflected in GDP. In fact the digital revolution might be driving down traditional consumption, reducing GDP yet simultaneously increasing our quality of life. Take for example eBay and second-hand goods. Having a new baby would have cost us twice as much in the pre-eBay era. Advances in communications technology has reduced consumption. And that's without mentioning the social internet. Before Facebook even quite close friends may have only learned of a new arrival 6 months after the fact. Now they know instantly. And what do they do with this instant knowledge? "Oh, we have a stack of clothes we no longer need - I'll send them, and if you don't need them, pass them on or take them to a charity shop." "Do you want a baby back carrier?" "Would you like a high chair?" We might just be seeing an end to the throw-away era, and the net economic benefit will be negative. Less money spent on fewer things, in relation to items with time-limited use, like baby stuff. Anyone in #Farnham have a chainsaw they can lend me for 30 minutes? Won't return it with bloodstains, honest! There's also medical advances brought by technology, as well as education and learning. Whilst GDP has stagnated, our lives are becoming enriched in ways that can't be measured in terms of economic output. All this isn't necessarily a good thing. Buying less and reducing waste is great, but reduction in demand will hit jobs and income, potentially causing a downward cycle. But what's the lesser evil, unsustainable consumption of resources or facing up to a future where the relationship between the economy and quality of life is more complex. Manufacturers will have to face-up to a new reality where rarely-used goods such as DIY tools are more widely shared. And that's without mentioning the thorny subject of digital sharing. The Enrichment Economy goes beyond giving, lending and second-hand sales. The consumption of most [legal, non-copyright-infringing] online entertainment provides far less to the economy than real-world alternatives. By entertainment I'm not just including commercial products but social interaction, photo sharing, discussion forums, amateur and some professional music available [legally] for free. Many websites sell advertising, and this will contribute to the economy. But many websites take the place of physical products, such as hobby magazines, etc, and ad revenue is on a different scale to e.g. the cover price of a magazine. 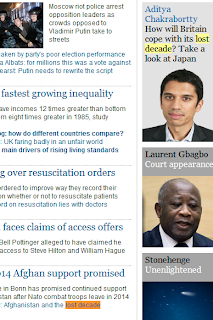 Back to the Guardian front page, we're reminded of nearly 2 decades of stagnation in the Japanese economy. Japan, the most technologically advanced nation in the world. Maybe we could learn something.